Im looking for a high riser on the top yoke my question is after a lot of research. 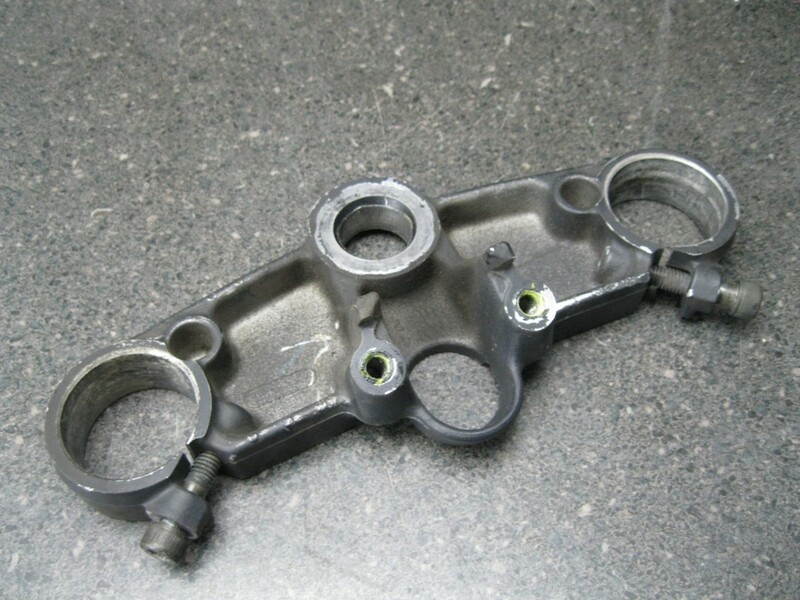 Would any of the cb600f models top yoke fit the F2? Also would the swap require any more parts than just the top yoke? Im currently in the begginer stages of building my F2 into a streetfighter and due to my missus having our baby this year my budgets become tight. Any help would be really appreciated! what are you trying to do? Do you want taller/higher handle bars? I'm guessing your referring to the top triple clamps that hold the forks and that your handle bars clamp to. F2 and F3 are the only ones that are a direct swap. But if all you're doing is wanting taller handle bars, look on ebay for a set of Suzuki SV 650 handle bars. F2's,F3's and SV650's have the same size forks, 41mm. They are taller by a couple of inches. Not the SV 650S handle bars. And if they are too tall you can install them under the top triple clamps but pull them up against the underneith of the top clamps. But remember if you raise the bars higher than what they are now you might need longer throttle cables, choke cable etc. I know a lot of those guys want clip ones and resort to F2/F3 equipment, so do some research and see if you could use a top clamp from one of their bikes. That'd be cheap, easy, and it'd look good too. Would there be any way i would be able to clip on the bars with something attached to the top of the forks? And I think you'll be alright cables/brake lines wise with a drag bar. Superbike or MX bars - different story. How would I go about drilling the top yoke, would it destabilise the integrity of the yoke or would it still retain its strength if drilled? Could you point me in the right direction to a thread where someone can show me how to drill the yoke? Thanks for the pointers btw looking at risers on ebay at the mo. Never had an f2 top triple detached in my hand but from what I found from the internets, this should be it seen belly up. Nothing to it, there`s plenty of room on the underside, however the places where you would be drilling don`t seem awfully thick so I`d do something like make a template of the bottoms of those areas to be drilled, take a scrap piece of fairly thick aluminum say, three-four mm and saw&file reinforcement plates under the nuts to divide the load to bigger area. I suppose big washers could do it was well if you file them so that they don`t carry onto the sides and the pinch bolts have sufficient room to tighten the shocks without bottoming out onto the plates. Here`s how I did mine along with some other stuff, the triple was thick enough to not have to strengthen, specially cause I had two bolts per clamp. Then of course there`s stuff like these LSL clamps but be prepared to shell out quite a stack of bills, anything that says Spiegler, LSL etc are ridiculously expensive. Then buy the risers for it. Draw it out on the top tree. Measure and re measure to make sure your measurements and orientation are correct/centered, and how you want it. Then drill with a drill bit that is the same diameter/size as the bolt that came with the risers. Drill slow (its aluminum). And use a drill press, not a hand-held drill. This helps ensure the accuracy. Now, you'll probably need bushings or a spacer to use the bolts/nuts that come with the risers. Get those from your local hardware store. Then you'll be good to go. Last edited by Conrice; 12-06-2015 at 08:35 AM.